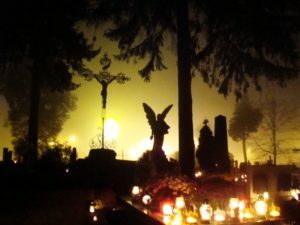 We celebrate the Solemnity of All Saints (All Saints Day) on Tuesday, November 1 and the Commemoration of All the Faithful Departed (All Souls Day) on Wednesday, November 2 with Mass at 8:00 am (our usual daily Mass time), and Rosary at 6:30 pm and Mass at 7:00 pm both evenings in our church. These are very special days in the cultures of so many of our parishioners who come from Mexico and other Latin American countries. El Día de los Muertos or The Day of the Dead has become popularized and even commercialized in this country but we get back to the faith-filled roots of these celebrations by joining together with our families in our homes and in prayer in our church this week. 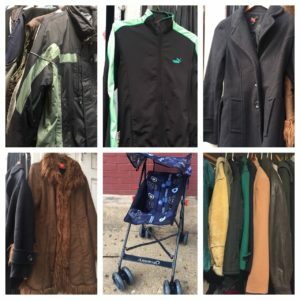 Winter Coat and Clothing (New and Used) Sale This Sunday! Are you and your family ready for the cold weather? You can find winter coats, jackets, clothes, and other household items for the lowest of prices this Sunday, October 30, from 8:00 am to 3:00 pm in the church basement at 1901 S. Ashland Avenue. The selection of clothes will include both high-quality donated items as well as new things. All proceeds from the sale support the mission of St. Pius V parish. 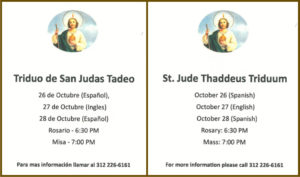 Our parish will host a Triduum (three days of liturgy) in honor of the feast day of St. Jude Thaddeus October 26-28 in our church at 1901 S. Ashland Avenue in Chicago. Each evening’s schedule will include Rosary at 6:30 pm and Mass at 7:00 pm, in Spanish on Wednesday and Friday (October 26 and 28) and English on Thursday (October 27). For more information please call our parish office at 312-226-6161. You can learn more about the latest news at St. Pius V parish and school in the pages of our quarterly newsletter, Good News From St. Pius V. The Fall 2016 issue is available here. For an archive of back issues of the parish newsletter please click here. For our weekly Sunday bulletin El Mensajero click here.